Tonight’s dinner caught me by surprise. Actually, the whole day kind of caught me by surprise. I don’t know why, but I just kept looking at the clock and it would be 3 hours later than I thought it was. Then it started snowing. That’s when we decided going outside was for losers. Then we played with LOTS and LOTS of toys. My child passed out under the table. I Skyped with a friend. And all of a sudden, my husband walked through the door. I did manage to get out of my pajamas today. I’m not sure at what time. We did DO stuff today, real stuff. Like cleaning and bathing and other such boring domestic things…but, wow…I haven’t had a time warp day like this in awhile…my senior year college roommates used to call it the Vortex…they were SO right. 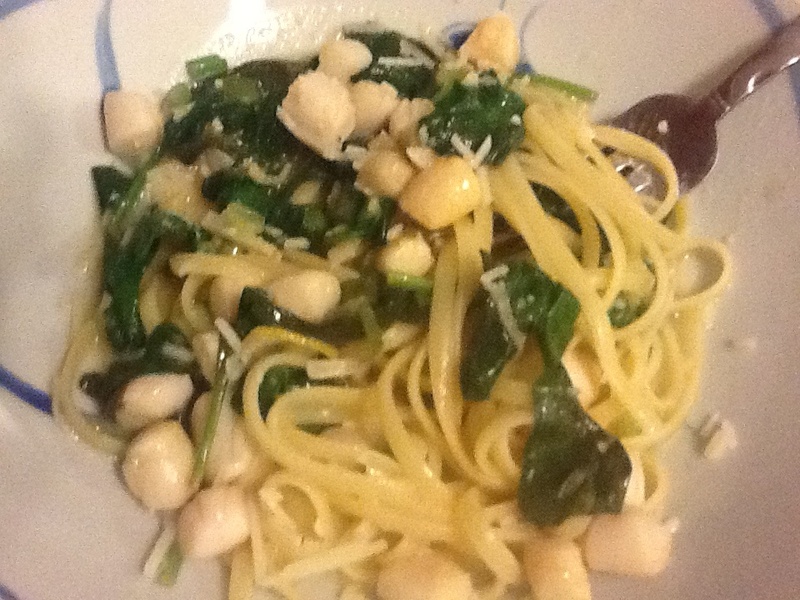 It was actually delicious, I shall call it, Lemon Spinach Scallops over linguine. Or something. I took 1/2 tsp of olive oil and warmed it in a pan. I then added two cloves of minced garlic and a thumb-sized piece of fresh ginger, also minced. I then squeezed a half a lemon and stirred. Zara threw a temper tantrum on the rug. I added a glug of Root Alcohol. She calmed down and joined me on her step stool. She threw in a stick of butter, and stirred everything. I then started cooking the linguine. I added the scallops, another half of lemon and a handful of spinach. As soon as the scallops were done I removed from heat and added 1 tbsp of half and half. Stir. Serve over linguine with a dash of pepper. Obviously, add salt if you want. That’s IT! It was SUPER easy and really really good (It’s probably the butter…). The Root alcohol gave it this really rich flavor that I was afraid was going to be sweet, but it ended up being an almost smokey flavor. Anyway, these flavors went really really well with one another. Make it, improve upon it. Send me your thoughts. It took 15 minutes tops. Can’t wait to get Jay to get some scallops! Definitely do! They are fantastic and SO easy to make on a night you don’t have a lot of time to prep dinner! Next Next post: Shake The Sillies Out!